Aitour was fantastic. We spent an entire day and enjoyed every minute. He was delightful and very informative. I give the highest recommendation! Aitour was an amazing tour guide. His English was excellent as well. He was knowledgeable, personable, accommodating and met our every expectation. I highly recommend him. Would give 10 stars if I could! Great tour guide who presented a comprehensive overview of Bilbao history...Very informative with respect to the art and artists presented in the Guggenheim Museum, and the importance of the museum to the energy present in the city center with the increase in tourism. The main reason why I always book my tours in Tours By Locals is because I want a local guide who will greet and entertain us as friends with sincerity, and Aitor was beyond our expectation! 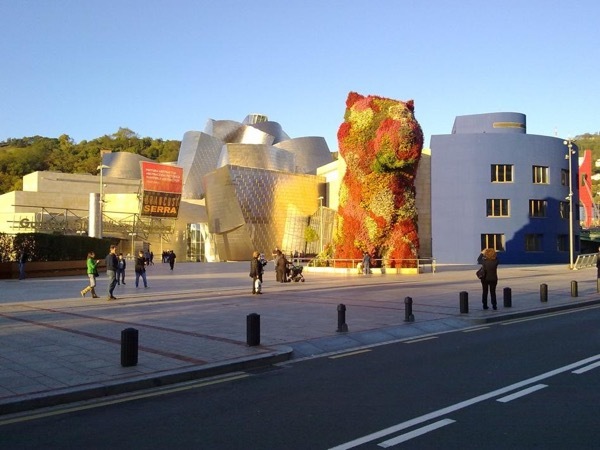 He is friendly, flexible, with good sense of humor, and very knowledgeable about Bilbao. You can feel his excitement sharing his hometown and the local flavors to us. We enjoyed the tour, he really took good care of us, and I highly recommend Aitor for those who want to have a worthwhile experience while in Bilbao! TOUR GUIDE RESPONSE: Thank you so much indeed! We had a wonderful day with Aitor. He picked us up an hour away at the cruise terminal in Santander and we headed to Bilbao. The highlight was The Guggenheim but along the way Aitor described Bilbao history and we viewed other stunning Bilbao architecture. We went to a local eatery that Aitor selected for us and it was perfect! Wonderful local wine, bread, fish and cheeses. Thanks for a memorable day! Aitor delivered a very competent and personal tour through the city. We enjoyed his guidance a lot. TOUR GUIDE RESPONSE: It was my pleasure to give you a first view of our city. And very proud to see the that you enjoyed it. Hope that next time we will have time to show you other areas nearby! Enjoy! Aitor D.
Aitor is an incredible guide. He knows everything about Bilbao and the Basque region and shares it in a very understandable way. He is charming and intelligent and customizes his tour to his clients' interests. I cannot recommend him more highly!!!! After touring with Aitor, you will want to return to Bilbao again so that he can show you even more! TOUR GUIDE RESPONSE: Thank you so much indeed Sarann! Hope to see you back soon here!!! This was our second tour with Aitor and it was as impressive as our first one. We visited the hanging bridge - viewing and using it. Aitor knew not only the history of the bridge but of the area. After this we drove around the coastal areas, visiting the marvelous Butron Castle, Bermeo and other wonderful places. We enjoyed a wonderful lunch of fish pintxos in Bermeo. It was a great day. Aitor is a wonderful guide. We have used many Tours-by-Locals guides and he is in the top three ever in 15 years. On our first full day in Bilbao, Aitor gave us a wonderful orientation to Bilbao and a guided tour of the Guggenheim. He checked in with us the evening before and arrived promptly for our walking tour. He showed us not only the highlights of the city but also some special places, such as the gentleman's club that became a library. He was very personable and friendly and quickly figured out our likes and dislikes. A wonderful guide. We had a late-afternoon, early-evening tour leaving from Bilbao and going to St Sebastian. Aitor was a terrific guide -- knowledgeable, friendly, well-informed and very helpful in showing us all sorts of wonderful aspects of city life that we never could have discovered on our own. We recommend him highly! TOUR GUIDE RESPONSE: Thanks so much for your review. San Sebastian is really a unique place and I really love it. Very happy that you did as well! Can't remember a more wonderful experience. Aitor and his driver Paco were excellent. Solid vehicle that was most comfortable, 'On time' service, selected a local restaurant with an delicious traditional basque seafood luncheon located on the river, provided a thorough tour of the Guggenheim Museum with skip the line tickets, strong historical background of the area, panoramic drive from San Sebastian to Bilbao, Excellent command of English. Tour was higher price,but worth it! TOUR GUIDE RESPONSE: Thanks! My true interest is that you have the most rewarding experience in our region, including our incredible food, but also our different, and sometimes complicate history and way of live. And I am so happy to see when you appreciate it. Warm regards, Aitor D.
If I could, I'd give Aitor even more stars. Despite a dreary, rainy day, Aitor took my family of four in hand and gave us a marvelous tour of Bilbao's Casco Viejo (Old Town) and some of the newer areas of the city. Informative, friendly and amazingly knowledgeable, Aitor was the perfect tour guide for us. He was able to get in depth when we wanted, or simply give us just enough information for context on what we were seeing. We could not have been happier. TOUR GUIDE RESPONSE: Thank you Richard so much! I really enjoyed meeting your family and I am very glad to have shared my knowledge and love to this surprising city of Bilbao. i had three tours with Aitor, and I will comment on them as a whole. He was the perfect guide...highly informed about Spanish history and the countryside, charming and helpful on all occasions. Additonally, he was very knowledgeable about art, a particular interest of mine. This was especially useful when he took us to the Guggenheim. I recommend him highly. TOUR GUIDE RESPONSE: Thank you Barbara for this wonderful review. I really loved to meet you and was very proud to show you best of our region. Hope to see you back again. Very warm regards! Aitor met us in Bilbao for our third day with him. We toured Bilbao and he guided us through the Guggenheim (for which he is licensed). We went to a local restaurant for a pintxos lunch. We then went to Guernica where we learned more about the Basque history. We considered ourselves lucky that we had three wonderful and informative days with Aitor. He is a terrific guide who quickly understood our interests. TOUR GUIDE RESPONSE: I really want to make your day most enjoyable at all times, and I am so happy when I see the gratitude that you share with future travellers. Thanks so much. Aitor gave a great city tour. He has a huge fund of knowledge about Bilbao, Basque culture,Basque history, and many other topics. Everyone in our group has travelled extensively, but we all agreed he is one of the best and most knowledgeable guides we had ever seen. He also has a delightful personality and we all enjoyed our time with him very much. He took care of many details and clearly wanted us to have a good tour. We recommend him very highly. TOUR GUIDE RESPONSE: Hi Miriam, it was a big pleasure for me to meet you and your friends and I have been very happy to show you the must-sees of Bilbao, but also other parts that locals enjoy. Aitor is one of the best guides I have ever had. I have hired over 30 private guides in countries such as China, France, Italy, Germany and the USA. Aitor took my wife and I through Bilbao one day and the Basque Countryside the next. The countryside is a must! Aitor's is fluent in English and has a thorough command of Spanish history. He explained the history of the Basques, Navarre, agriculture, industry, the civil war..Plus he knows the best restaurants. Easy to be with. Helpful, not intrusive. TOUR GUIDE RESPONSE: Thank you very much. The Basque Countryside is often not considered in the shadow of Guggenheim Museum but it is really a surprising part of our region and I am very proud to have the opportunity to show it to you. Specially as you came only for an evening originally and, once you tried my services here, you decided to make the booking for the following morning. This tour was amazing. Aitor was an amazing guide answering all our questions. I would definitely recommend him to all my friends and family who travel to Bilbao. TOUR GUIDE RESPONSE: Thank you! Very happy to meet you and hope that we will have a chance to see the wineries of Rioja and Vitoria, the Spanish Gastronomy Capital 2104 in a next visit. Our guide, Aitor was an enthusiastic young man who knows and loves his city. It was a pleasure to spend time with him in Bilbao and especially at the Guggenheim Museum. This way of touring is so much better than a large group tour because the guide can adjust the tour to the interests and pace of the clients. Our group of 4 was very very satisfied. TOUR GUIDE RESPONSE: Thank you very much for your review! I am really happy that you enjoyed the tour in Bilbao and the Guggenheim Museum. I am happy to give the local insider point of view to make the visit unique. Aitor is the best!!!! Smart,funny, knowledgeable. Would highly recommend him to anyone! TOUR GUIDE RESPONSE: Thank you very much. I also enjoyed a lot showing you and your family about Bilbao and the events of Christmas time in Spain and the Basque Country. My wife and I enjoyed the most amazing 2 day tour with Aitor. He picked us from our cruise ship and drove us to the cities we had requested months before. One was near Bilbao where I lived 45 years ago. Aitor went out of his way to ask strangers about a distant relative and we found her! It was incredible. We insisted on having Aitor join us with our meals. His presence enhanced our dining experiences and we feel Aitor is now a friend. We will be using him again when we return to the Basque country. TOUR GUIDE RESPONSE: Thank you for the the time you shared with me. I enjoyed a lot meeting you and showing some beautiful parts of your country in your limited time. Looking forward to see you back soon. Aitor did an amazing job on our tour of Bilbao! He was friendly, knowledgeable & could not do enough to make our tour special & customized. He made sure that we did not have to wait in the queue for tickets to the Guggenheim and even took photos of us and our friends which he emailed to us. His tour was the perfect combination of letting us experience the art and providing us in sight. Aitor also offered to mail our postcards for us & sent a confirming email that he had done so. We HIGHLY recommend him! TOUR GUIDE RESPONSE: It makes me happy to know that you enjoyed the tour as I did. It is my willing to make your experience in Bilbao unforgettable and I am very glad on helping you in all the ways I can. Hope that we have other chance to meet longer next time to show you also other interesting cities and villages around. Aitor went beyond our expectations! His knowledge, enthusiasm along with customizing the tour our wants was more than we could have asked for. His grasp of the history, culture, architecture and hidden gems of the Basque area provided a fabulous day. His mastery of multiple languages and great communication skills made the day easy and fun for us. We would highly recommend him as a guide. Well done! TOUR GUIDE RESPONSE: Thank you for your review. I always try to make your Basque experience the most personalised and memorable. I am very happy to see that you had a fabulous day. Aitor was our tour guide in Bilbao to the Guggenheim and surrounding area . He was waiting at the airport when we arrived and immediately began the tour. He was very knowledgeable about the city and its historical beginnings. He also offered many details about the museum & explained and answered all our questions. He spoke very good English and was easily understandable. He was courteous, amicable & flexible about our requests as the day progressed. We would highly recommend his services! TOUR GUIDE RESPONSE: Thank you for your comments. I am happy you have enjoyed the day we have together in Bilbao and neighbourhoods. I felt proud to share with you the history, situation and characteristics of this not so well known, and often surprising, corner of Europe. TOUR GUIDE RESPONSE: Thanks. I always do my best to make your stay the most enjoyable. I am happy to see that my objective of making your stay in the Basque Country special and memorable was achieved.